The Media Center represents one of the most important parts of my home. Front and center, you will find my 47" Vizio 1080p TV. This TV is connected directly to my media center PC, located in the tall cabinet to the right. 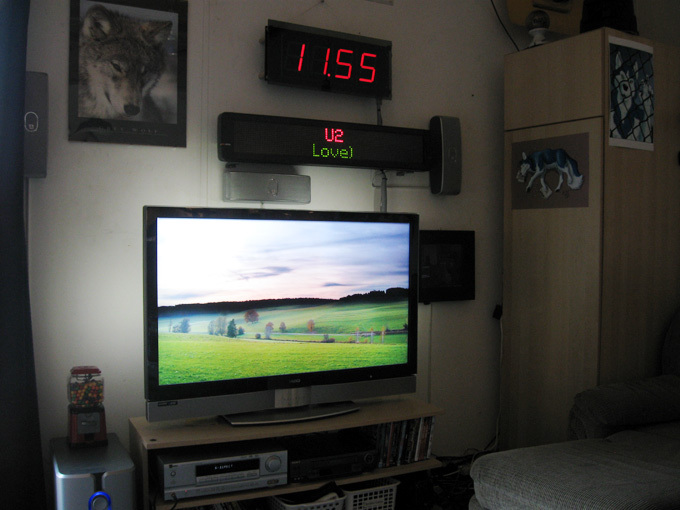 Above the TV is my LED Sign and home-made LED Clock. To the right, you'll see my Digital Picture Frame. Notice the lovely picture being displayed on the TV? Each time I turn on the TV, a program I wrote automatically applies a new high-resolution background image. It downloads new images every day, so there's always something fresh to look at on my TV. This is my Viewsonic DLP Projector, resting on some books to get the angle right. One day I'll get around to mounting it on the ceiling. Mounted behind the projector is an IR Transmitter LED. This allows the computer to control the projector automatically. The projector is connected to the Media Center PC. This is a Core2Duo 2.4, a computer whose sole purpose is to play videos and movies, record TV shows, and play music. It's connected to two sound systems: A modern 5.1 setup for movies, and an older Sony amp for whole-apartment music. The Sony amp can be turned off automatically when watching a movie. The main application that makes my Media Center function is the program I've titled MediaDaemon. It is an interface between my music and video collection and the rest of my home. It takes over Winamp and Media Player Classic, and controls them, using the features they provide to play music and videos. MediaDaemon runs entirely as a background, and has no visible interface. It is controlled by several other applications. MediaDaemon stores it's song data in a MySQL database, for speed and reliability. One of the "control" applications which interfaces with MediaDaemon is the Touchscreen, which provides basic music controls like play/stop/pause/next/previous, playlist editing, playlist selecting, and Love It/Hate It functionality. See the Touchscreen section (linked above) to learn more. AvKeyLinc is a keyboard hook application I wrote for my other computers. Currently, I use it on 4 different machines simultaeneously, each one doing a different job. This interface allows you to quickly choose a playlist, edit or rename a playlist, and build a quick playlist via search. The search is extremely fast and brings back hundreds of matches instantly. In this screenshot, you can see I'm searching for Coldplay, and I've selected some tracks. I can now play these immediately, or play them after the current song is finished.